Recipes seem to be coming more easily to me than words lately. Whenever my world feels a little out of balance I always turn to the kitchen. It’s grounding when it’s not necessary. Something like a big cozy stew or a tried + tested baked good usually does the trick. There’s peace in the slow stirring, the measuring, the smells and the colors. 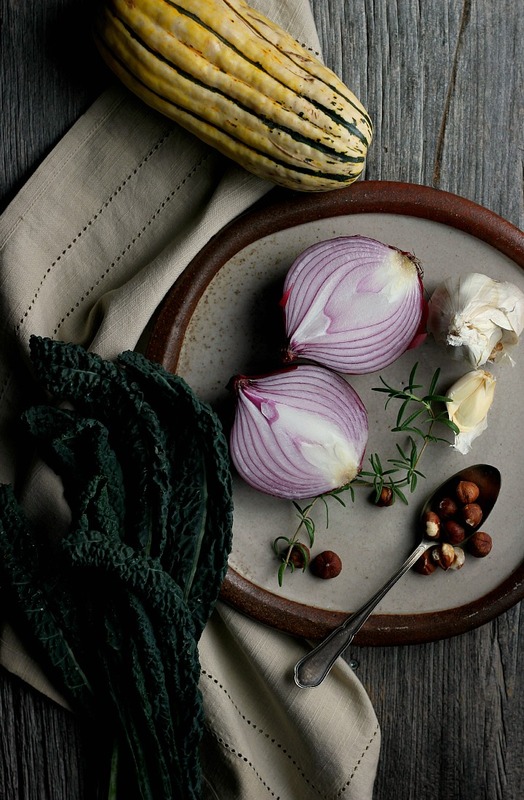 The season’s produce and the change in weather have me retreating to the silence of the kitchen even more these days, something about this fall weather just has me craving a little more space in the quiet. I think it is because in my head I know Matt is leaving soon, but I haven’t quite allowed myself to settle in just yet. Scared that it might make it harder when he goes and knowing that I want to fall into comfortable routines of my own instead. We’ve moved around a lot together, and while the distance is never easy and the changes are often uprooting, we now know that no place or time is ever perfect. If you want something, you just have to jump in with both feet and go after it. I am so proud of him for taking the leap and for going after want he wants. Sometimes I selfishly regret being the one to nudge him into it, but I know in my heart it is the right choice for right now. I also know that time on our own will be good for me as well, just as it always is. I so am often blown away by this space and the connections I’ve made here, and last week was exactly one of those moments. I was just feeling a little scattered and couldn’t find a darn thing worth scribbling down for a post, but all of your thoughtful comments just reminded me why I keep coming back here. We are never alone. So thank you for all being here with me. 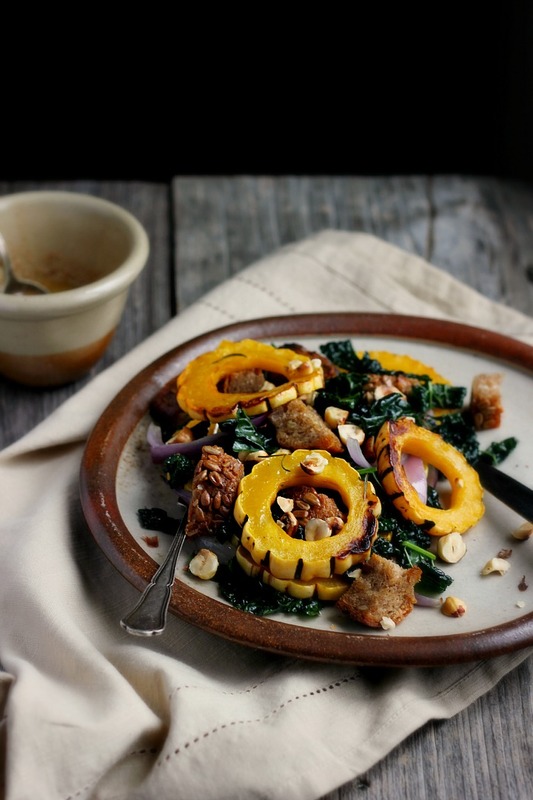 Every season has a salad and this combo of roasted vegetables, dark leafy greens and warm spices are exactly what these cooler days are calling for. Use whatever bread you like, I am a sucker for sourdoughs but I imagine a seeded gluten free loaf would work here as well. 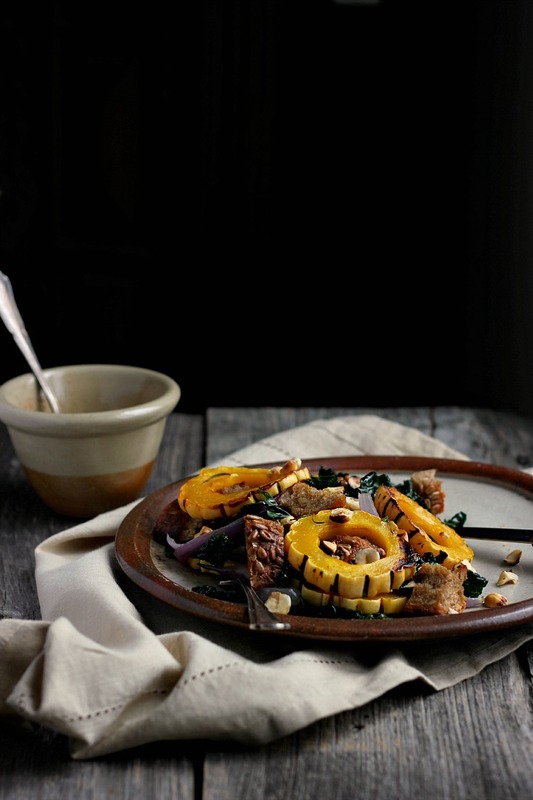 And when that cinnamon cider dressing hits the warm roasted veggies, oh that smell!. Add extra kale to bulk this out into a side dish to feed a few more hungry bellies (or for your own second helping of fall comfort). 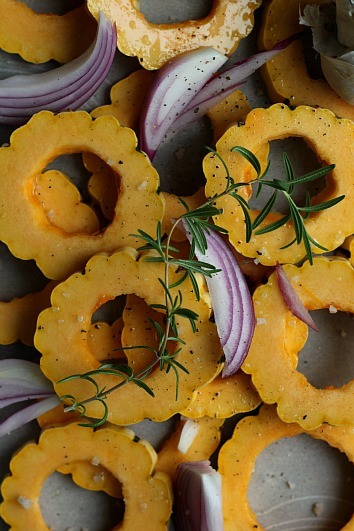 Slice the squash into thin rounds and scrap out the seeds and inner flesh with a spoon. 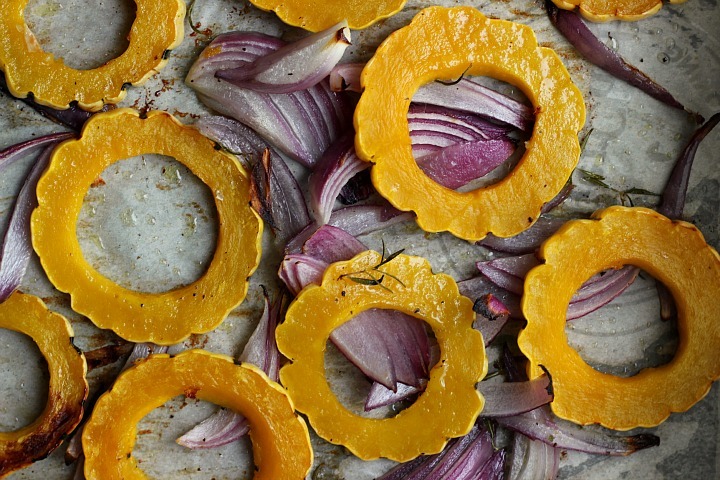 Slice the onion into thin strips and place on a lined baking sheet along with the squash. Drizzle with olive oil (about 1 tablespoon), season with salt and sprinkle over rosemary. Toss together to evenly coat. Wrap garlic cloves in aluminum and place on the sheet with the vegetables. Roast in the oven until tender, flipping once – about 25 minutes. Remove and let cool. 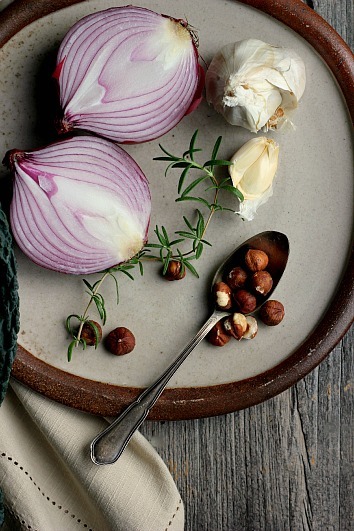 While the vegetables are roasting, add hazelnuts to a dry skillet and toast until fragrant, about 2 minutes. Let cool, then wrap in a clean tea towel and rub together with your hands. This helps to remove the outer skins for a perfect, toasty little nut. 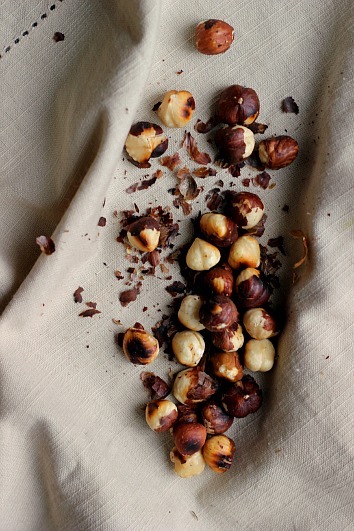 Give the hazelnuts a rough chop and set aside. 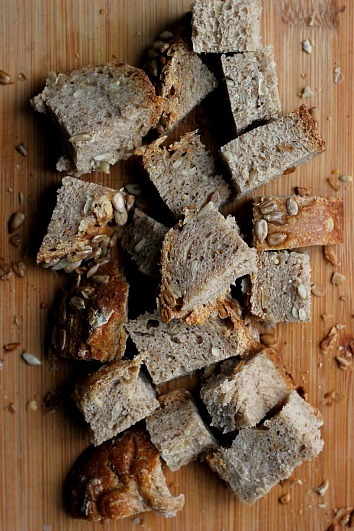 When the vegetables are almost done, cut the bread into rough chunks. 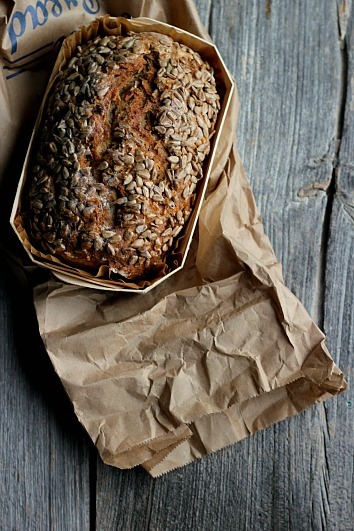 Place the bread on a baking sheet and drizzle with a good coating of olive oil and sprinkle of sea salt. Toss together so that the oil is well absorbed. If you have an oven with a double rack, place bread on the lower rack and bake until brown and a little crispy, about 10 minutes. If you only have one rack, place the bread in the oven once the vegetables are done and cooling down. 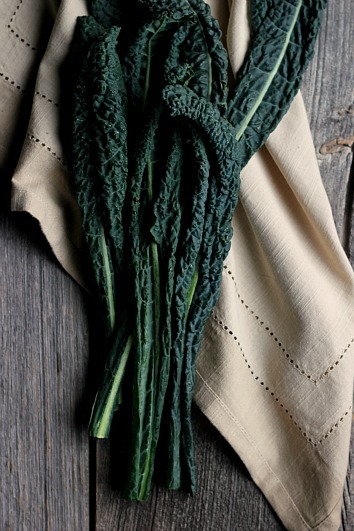 Remove the leaves from the rough stalks of the kale and chop into thin strips. You can choose two different ways to serve the kale. One, sprinkle with salt and a little olive oil and massage the kale between your finger tips. Continue to massage until the leaves are deep green and have softened. Or, place kale in a large pan with a drizzle of olive oil and sauté until deep green and just starting to wilt. Both options are great, I quite like the taste and texture of raw tuscan kale but if you don’t, choose the second option. Remove garlic from foil and squeeze out the cloves. Roughly chop and then using the flat edge of a knife squish into a paste. Place garlic, olive oil, apple cider vinegar, cinnamon and a pinch of sea salt into the a small blender and blend until smooth. 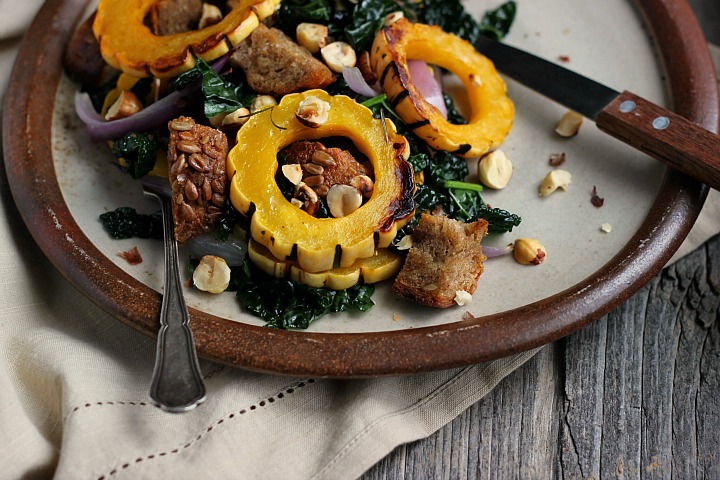 Toss vegetables, croutons and kale together. 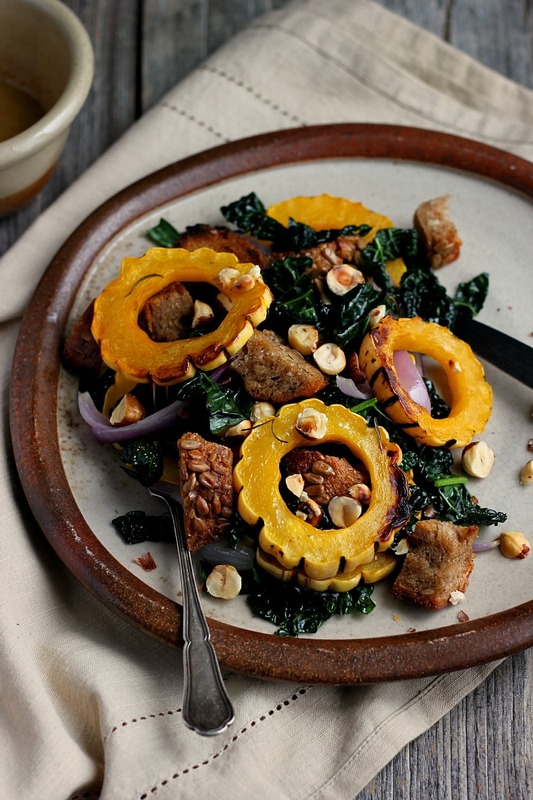 Add dressing and sprinkle with toasty hazelnuts. Serve warm. I think this is the first panzella that has actually appealed to me! Must have something to do with the squash, and you can’t go wrong with dino kale. I love the concept behind this salad and everything involved! Would be a lovely alternative to stuffing on Thanksgiving. Yum! I am the same way. When I feel stressed or emotionally off balance I always find myself in the kitchen. Baking is my thing at those times. For some reason baking has always felt so natural to me. Somehow I just know what to do…cooking has taken more learning and reading, but I have grown to love it just as much. This salad looks great. I too have loved becoming part of this community and meeting wonderful people who share with each other so openly and heartedly. If you don’t have love and support, what have you got? Good luck to Matt on his amazing adventure! If you made this salad for me tho, I might think twice about leaving! ;) It looks so delicious! I think I have most of these ingredients on hand! Have a great weekend! My heart goes out to you Jodi and I hope that the kitchen can really become a place of solace and comfort to you while Matt is away. Spending time apart is so hard – particularly when you’ve spent so much time adventuring together – but I’m sure you’ll both make the very best of the situation and emerge stronger from the whole experience.